It&apos;s a treaty, signed by most civilized countries in the world, which controls trade in any endangered species or parts thereof. All corals are listed in the Treaty as "endangered" (or something akin to "threatened" status in the U.S.) and by extension, this also includes all live rock. If an animal is listed, trade in it is controlled. There are different "schedules" for relative degree of rarity. 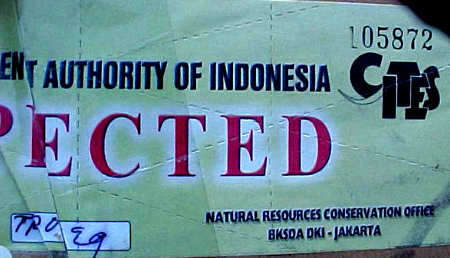 The rarest animals are Schedule I, such as Elephant, Tiger, Rhino, etc. Schedule II species are not critically endangered like the above mentioned species (which are still poached), but current take levels are deemed beyond replacement capacity, the species is "threatened," and the trade is controlled. These permits are for the importers and exporters, not the hobbyists. This is good. Killing Rhinos to grind their horn into alleged aphrodisiac should be "Murder 1"! It brings international attention and money to species that are on the brink of existence. The tremendous and incredible news from late 2002 at the annual CITES convention (in Chile for that year), was that SEAHORSES got listed as a Schedule II species, and wild-caught seahorses will soon be prohibited from being collected, sold, imported. It takes awhile from when such decisions are made, until they take effect, but it will happen soon! Whilst I don't recall the exact number, it was some ridiculous total like 20 to 200 metric TONS of seahorses being "harvested" yearly, mostly for medicinal purposes! Dried and ground up! The fish hobby suffers the consequences of some other source of exploitation, and extremists always seem to point the finger at the hobby, which is the least of the problems. Hobbyists turned aquaculture-business people are the ones who now will breed the world's supply of captive live seahorses. At the annual meetings, besides listing or de-listing sps., they cover things such as whether or not signatory countries are truly monitoring and enforcing quotas and limits on how many of any listed species are taken. A country that is not may be embargoed by other signatory countries. It's big and serious stuff! And all our corals, clams and live rock are part of this great machine. New quotas are set for taking corals after the beginning of each year. Every year it takes longer for them to do their thing and set the annual take quotas. Hmmmm ... I wonder what they're waiting for? These quotas are divided up between the various shippers. From Jakarta, Indonesia where much of the "bread and butter" coral supply comes from, they used to come out on Jan 1, but that has now changed over time, so quotas are typically set much later into the the first quarter of the New Year. Meanwhile, all they can ship is what they had left unshipped in last years' permitted allotment. In most cases, that means "Scleractinia," which is a blanket listing for all soft corals: mushrooms, leathers, polyps, and such, generally an item or colony, attached to a rock, which might have anything on it. Usually all kinds of unbelieveable, cool stuff. Things you can't order. Countless times, the best part of a leather is what is growing around the base of it! Most of these rocks have coralline algae, besides the main attraction, but the good ones have LOTS of other stuff on them, that is often better, rarer, more interesting than anything you can order! Meanwhile, there are hardly any hard coral permits at the beginning of every year when no one can get enough, if any hard corals. Of course, this is the time after Christmas when there are thousands of new tanks, or gift certificates, and people looking for... you guessed it, hard corals! The time when the demand is greatest, the supply is thinnest. Welcome to the "fish biz!" Funny in an ironic way, eh? In the summer when ya can't find anyone home with their tanks, we can get anything ya want! All this underscores how important aquaculture is and will be. It is the future, and the answer. While aquacultured species are still counted and tracked just like wild CITES species, these specimens travel essentially "Carte Blanche" as far as permits go. How can permits be denied for farmed animals? It is amazing today how many places have literally hundreds of species of marine animals available that are farmed, in the U.S., and on many of the various islands in the Pacific. This is good! We should support these operations if you can find a reputable one. Virtually every island has a clam farm to supply locals with food. Extras are sold to us dummies who just stare at them! There are, however, a couple of flaws in the way the CITES program is actually executed. We have all heard horror stories about entire shipments of corals being seized over something not on the CITES permit when it has nothing to do with whether it's rare or not, just that it's not on the permit. These stories go that a hundred boxes are seized and die over one piece, which may or may not have been identified correctly! Even our inspectors here in the U.S. don't always know all the animals when they come in and are in three or four layers of translucent bags in the dark. Most coral experts would argue that you would need to examine the dead skeleton under a microscope to postively identify them to species, and, often genus. Often a very big deal is made of silly paperwork errors because training foreign clerks to do the paperwork to U.S. government standards can be difficult at best. Again, shipments may be denied entry, or an importer fined, over a common animal. Then, are the exporting countries really enforcing quotas that are REALLY realistic? Without proper scientific surveys of how many there are, where, how can the "take" be effectively estimated or controlled? Perhaps the most irregular aspect of it all is the very listing of all corals in the first place. NO animal with soooo many of them left could get listed in the U.S., or by any state, as protected. 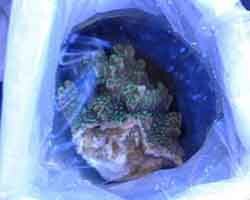 There are millions of most of the corals we keep in the hobby. Petition our U.S. Fish and Wildlife to list something with this many of them and they would laugh at you. So, whether or not the numbers and listings are really essential or political is a matter of view. Most of the damage to reefs is not from hobby collecting. 50% of Sri Lanka&apos;s, reefs, like many places, were dredged for the only local source of limestone for cement, and are in the roads and buildings. You can, unfortunately, still drop the anchor of your yacht through the reef in most places, but don't try to study it, farm it, keep it, or worship it ... you'll need a dozen permits for that! Why we can't work out a cement for corals deal, even if it is to save certain reefs as reserves, I don't know. Industrial, agricultural, and urban pollution, dredging, dynamite fishing, mining, and global warming (El Nino bleaching events occurring at a heretofore unknown rate) all remain much greater threats to the reef. Those who save it will be those who got to keep, see, or know some of it. Just make sure you have your CITES permits if you import or export any! And show your supplier some mercy at the beginning of the year when new permits aren't out yet!